Luckily for food manufacturers, conveyor technology has not stood still. A number of vendors have introduced innovations this year that move the technology that moves your products. For any class of ingredient, product or finished package, there's a conveyor suited to move it down the line. Despite the many conveyance methods used to accomplish the task, there are common elements that reflect food processors' needs. These include features and options that save space, foster safety and sanitation, reduce maintenance and downtime and preserve product integrity. Of course, in a well-managed process, features work in synergistic fashion so that fast, easy sanitation leads to reduced downtime; gentle product handling enhances product quality and reduces waste; and even space-saving equipment designs play a role in plant profitability when smart designs lead to faster installation and — as with the best innovations — the ability to do more with less. Key Technology (www.key.net), Walla Walla, Wash., known for its vibratory conveyor systems, introduced a new kind of conveyor called the Horizon earlier this year. The horizontal motion conveyor moves product with a new rolling mass technology-based drive that uses a gentle, gliding motion versus up-and-down vibratory motion. That minimizes breakage and coating loss to minimize product breakage. This makes it suitable for many fragile, seasoned, coated and frozen food products, plus it prevents buildup on the conveyor. In addition to single-constituent streams, the sliding motion is ideal for mixes such as trail mix or granola, which can be conveyed without separation for a "strong assurance that within any given package, you're going to get very accurate results in a blended product," says Steve Johnson, product marketing manager. Key Technology earlier this year introduced a horizontal motion conveyor: the Horizon. A maintenance-reducing "lube-for-life" drive that moves with the pan runs significantly quieter than vibratory models and can be mounted anywhere along the conveyor pan — even in front or underneath the pan. This, along with the flexibility to install the Horizon on the floor or suspend it from the ceiling, accommodates users' space constraints. The drive system can move product at speeds up to 42 feet per minute on a single continuous conveyor up to 100 ft. long. Reverse-direction capability adds to the system's flexibility. Another company stretching its technology is Bunting Magnetics (www.buntingmagnetics.com), Newton, Kan. The company uses its metal detector know-how for the Washdown Magnetic Transfer Conveyor, which features stainless steel for easy cleanup and reduced downtime in applications where processors need to move product up and through a plant quickly, such as the transfer of full or empty cans throughout a process, from steam-based processes to filling stations and labeling machines. "It is perfect for can handling applications where there are changes in elevations," says Charles Whitt, director of marketing. Indeed, the most common application for these conveyors is a high-speed can line, typically operating between 100 to 600 cans per minute. The magnetics provide proper spacing and positioning without product jams, because the design is "simpler and less complicated than the typical non-magnetic squeeze elevation conveyors," says Whitt. Additionally, the wash-down model is the choice for sanitary requirements, which these conveyors meet with food-grade or sanitary stainless finish; food-grade belts; full wash-down motors and drives; and composite wash-down bearings. Design features include specially designed ceramic or rare earth magnets that stabilize the cans at high speeds and magnetic elements that are custom-matched to the can size, weight and speed. Sanitary and wash-down features along with "endless" belting help make these conveyors "almost maintenance free," says Whitt. For space savings, these conveyors provide a low profile transfer of lids or cans to filling stations where space is restricted and very tight. A different design in conveying is the tubular drag conveyor from Cablevey Conveyors (www.cablevey.com), Oskaloosa, Iowa. They excel in the gentle handling of materials, including roasted whole bean coffee, cereal loops and flakes as well as nuts. This type of conveyor uses cable-driven, disc-shaped flights to pull product through closed, sanitary piping. The closed design protects the product from ambient conditions while containing dust from escaping. Also, the flights provide gentle handling to keep from crushing nuts or even tea leaves. Clean-In-place is fast and easy by virtue of the closed-loop design. The ability to install tubular drag conveyors in horizontal, vertical and curved configurations saves space and can eliminate the re-engineering of plants and processes. And with maximum motor size at 5 amps for the largest system, compared to traditional conveyors using 10 times the power, tubular drag conveyors greatly reduce power requirements as well as plant noise. "We've all had the experience of walking through a plant with ear plugs, masks, glasses and helmets – and that's still necessary – but we've seen dramatic reduction of material particulate in the air because each system we install is enclosed," says Karl Seidel, marketing manager. Cablevey keeps the beans flowing to the Probat-Burns coffee roaster at Apffel's Coffee in Santa Fe Springs, Calif. Depending on the tubing size — diameters range from two to six inches — throughput ranges from 75 to 1,240 cubic feet per hour, moving product at an average speed of 100 ft. per minute for a "low-speed but respectable throughput where more traditional systems might damage materials," Seidel says. The AquaPruf Stainless Steel conveyor platform from Dorner Manufacturing, (www.dornerconveyors.com), Hartland, Wis., offers a convenient, sanitary option for plants that use curves in a wash-down environment. It's primarily used to optimize available space in the processing area, where curves reduce the number of transfers, as well as to move product in and around equipment, pillars and other obstructions. "The use of curves reduces the number of transfers required and therefore reduces the potential for product loss as well," says Mike Hosch, director of new product development. The design of the curve sections is an improvement over traditional designs that use fasteners to remove the plastic chain hold-downs from the curve and this — combined with the platform's tip-up tail, clean-out windows and hygienic design — allows for fast and effective sanitation. "The chain simply lifts out of the curve," says Hosch, adding, "Access to the inside of the conveyor frame is literally only seconds and requires no tools." The "no tools" feature is a speed and sanitation claim to fame for this design. In operation, Dorner's belting is held down on the outer edge and slides along a guide strip on the inner edge. Tools have been eliminated because this design provides just enough tolerance to allow the user to push the chain from the inner edge toward the outer edge. This eliminates the need for fasteners to be used, which, in other designs, need to be in place during operation, and removed for cleaning or maintenance. At the end of the line is the bottom line. Food processing users must calculate their return on investment based on factors unique to their own operations. In doing so, it's important to look well as beyond the mechanical footprint of the conveyor itself. "In some applications, customers have calculated saving 30 to 40 production hours a year by incorporating AquaPruf Conveyors into their processing facilities," says Hosch, adding that complex applications can also lead customers to consider water, energy and the chemical savings during sanitation. "Recently we've been sourced by some of the largest processors of almonds, peanuts and cereal globally," says Seidel. "This has occurred after a lot of testing, trouble-shooting and responding to requests made by these processors. Obviously this is where a combination of close attention and customization come into play." He notes that Procter & Gamble installed a system in Mexico and reported that "the system paid for itself in electricity costs alone within the first year." Another aspect to factor into specifications is flexibility. In addition to specifying the right systems, options and add-ons, processors must consider how a unit will effectively serve upstream and downstream production today and into the future. 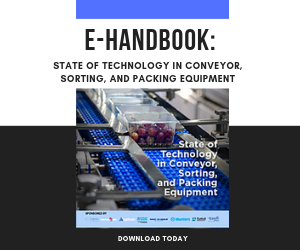 In this respect, conveyor sellers as a whole have been doing a good job of following a trend toward modular equipment and controls as well as mechanicals. No matter the need, there's always a system to suit today's needs while flexing to meet tomorrows product, package and line configuration requirements. 'Ideal' is whatever suits your needs, but all conveyors strive for sanitation and efficiency.